All River Crossing homes currently listed for sale in Spring Branch as of 04/18/2019 are shown below. You can change the search criteria at any time by pressing the 'Change Search' button below. "Beautiful craftsmanship & meticulous attention to detail, situated on 2.70 acre lushly landscaped & treed lot. Incredible handcrafted white oak cabinetry throughout, gorgeous travertine (under-lit floor in entryway) & Brazilian cherry wood flooring. Gourmet island kitchen offers all Viking appliances (except Bosch dw), butler's pantry & warming drawer. Master retreat incl sitting area, dbl fp, separate vanities, bidet, whirlpool tub. Guest/media rm w/full bath up. 1677 sq.ft. of workshop & gara"
"Stunning panoramic views await you at this beautiful 3+ acre hilltop estate. The bright & open custom floorplan offers 2 living areas, 2 dining areas, formal office, gameroom, and flex room for exercise or 2nd office. The island kitchen boasts granite countertops & double ovens. Owners retreat has incredible views, outside access, & double vanities. ALL bedrooms have ensuite bath & walk-in closet! 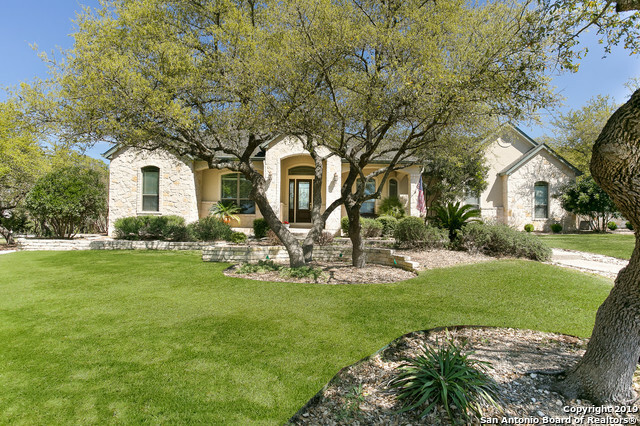 Very private backyard is perfect for entertaining with covered patio and recently resurfaced spark"
"Great Hill Country home on 1.7 acres. 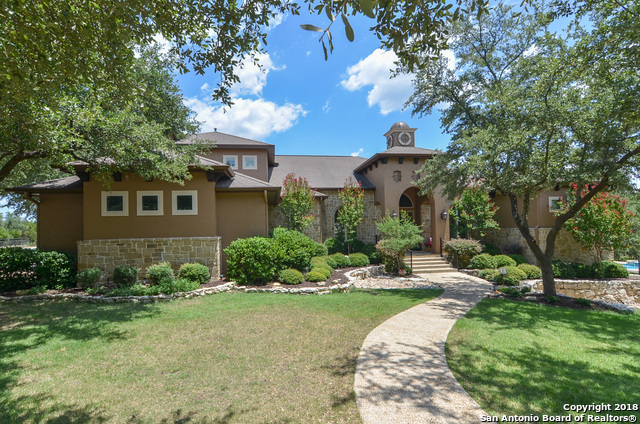 Enjoy privacy as you drive up the long winding driveway into a fabulous Mediterranean style home. This home has 4 bedrooms and 4 bathrooms on the main level. Upstairs features a media/gameroom complete with kitchen and bathroom. The master suite is large with a beautiful walk in shower and dual vanities. The backyard is a true oasis with outdoor fireplace, outdoor kitchen, pool, spa, covered entertaining area and dog run. This one won't last! Come see"
"Spacious, 5/3.5, mostly one story, 4209 sqft, Shields Custom Homes in golf curse community, oak tree shaded private lot, quiet St. w/private backyd outdoor living area; Lg country kitchen w/built-in SS appliances, breakfast bar, center island; FL, FD, study or 5th bdrm; Lg master suite w/sitting area, WI closet, oval tub, WI shower w/multi heads; 5 bdrms or 4/study; 4 side stone/stucco; Multi cvrd patios, sprinkler system; HOA parks/pool/river front. Golf course memberships available." 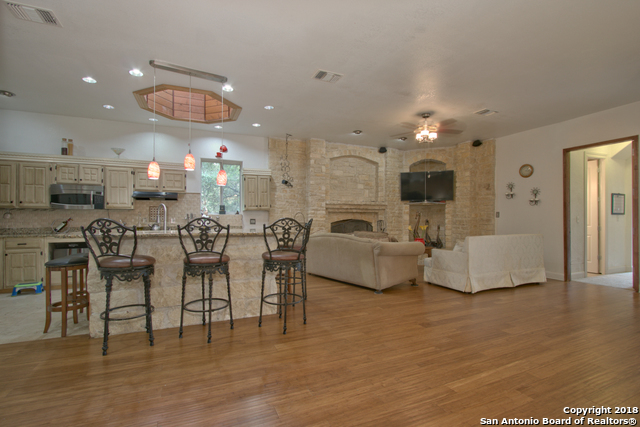 "One of the most beautiful homes in River Crossing in The Waters gated area. Backs up to a green belt with unobstructed views beyond, just like living in the country. Close to the residents' Guadalupe River park. Great open floor plan for entertaining. Chef's delight kitchen with double ovens and warming drawer. New wood floors in all 3 bedrooms and office/room by garage. New high end carpet in media room. New wrought iron fence. Each bedroom has its own full bath and walk-in closet." "Beautiful home in River Crossing. 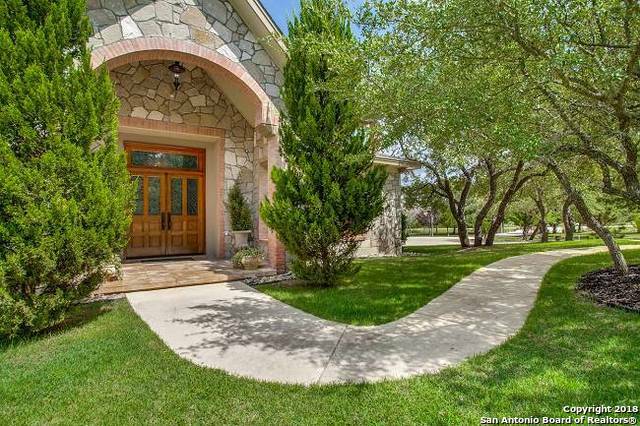 On quiet cul-de-sac & backs to 1200+ acre ranch for privacy. 3/3 w/study. Luxury master suite w/windows overlooking pool & wonderfully landscaped backyard. Backs to east. Dual shower heads & jetted tub in master bath. Secondary bedrooms spacious & a lg. study. Living area centered around gas fireplace & has huge windows. Island kitchen w/gas cooktop! Frig conveys. Built in gas grill in back yard. 3 car garage. Wrought iron fence. On hill with views. Private riv"
"Beautiful home w 180-degree views, 20' ceilings, open plan & sunlit rms. Views of outdoors in family rm, kitchen, breakfast rm & sunrm. Gourmet kitchen w island, SS appliances, granite counters, butler's pantry & rock arch. Private master suite w spa-like bath, opens to lg closet w built-ins & access 2 study. Upstairs- 2 beds w private baths & gm rm w wet bar & flex space can be 4th bedrm . Balcony w Twin Sisters views. Patio w Hot Tub, 2 private acres-mature oak trees & more views. C tour-more "
"STUNNING HOME w/GORGEOUS VIEW OF GOLF COURSE! Across from the #1 Green! COUNTRY CLUB LIVING AT IT'S FINEST! Gym, Clubhouse, Full Service restaurant/Bar to include Poolside Service! Just in time for summer! Enter to those Beautiful Views, Luxury Custom Finishes, Fantastic Island Kitchen,WBFP, Master Retreat w/SpaBath, Private Office and more. Upstairs find Additional Living w/Balcony, 3 more bedrooms (1 could be 2nd master),2 baths, MEDIA ROOM/WET BAR! Natural Light beams throughout this home! 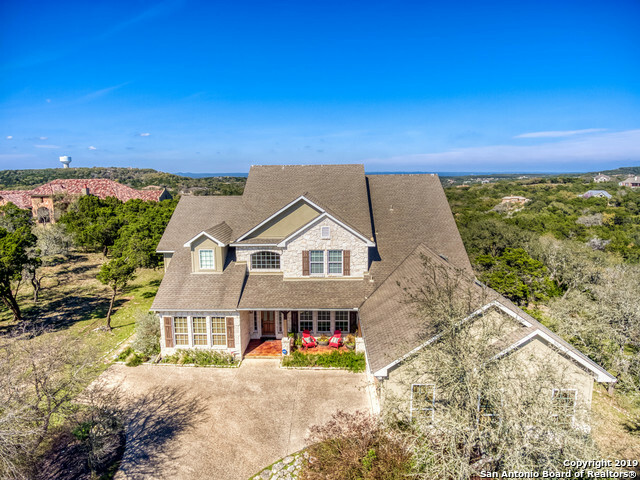 TH"
"Private gated entrance with wrought iron fence, adds to the charm of this gorgeous Custom Hill Country paradise, on 4.2 acres! 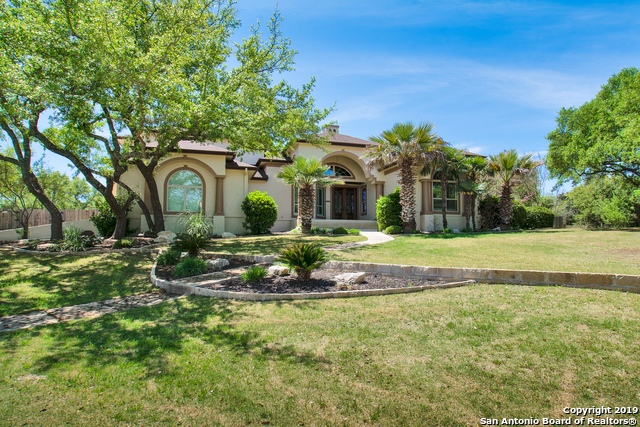 Stone & Stucco exterior with oversized porch, rear covered patio and 3 Car Garage! 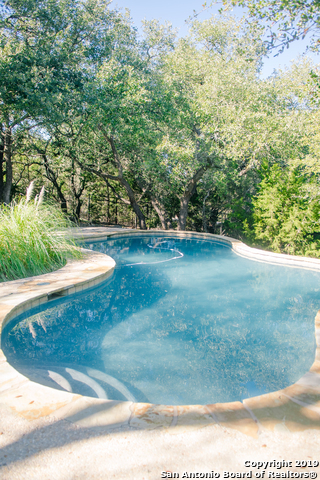 Heated spa and pool, with an outdoor fireplace, is perfect for entertaining. Inside features two story ceiling in living/dining area with fireplace, custom staircase, cool stone flooring, plantation shutters, radiant barrier, downstairs master & hobby room. 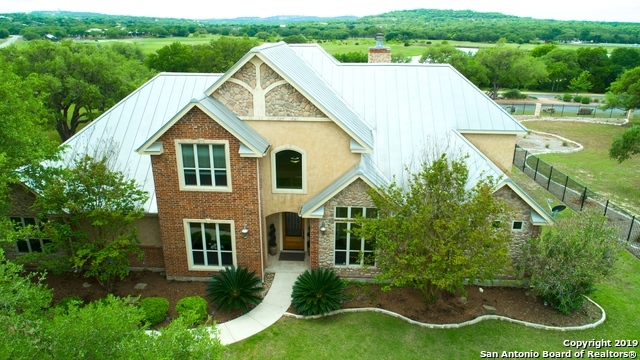 Tons of storage and Open floorpl"
"Located on 8th fairway w views of course & Hill Country. Newly renovated w wood-look tile n main living & wet areas, wood stair treads to upstairs game rm w full bath & new carpet in bdrms. Kitchen redone w 15 deep custom cabinets, quartz counters, backsplash, SS appliances + double convection ovens & reverse osmosis sink. Bathrms renovated w quartz & granite counters & faucets. 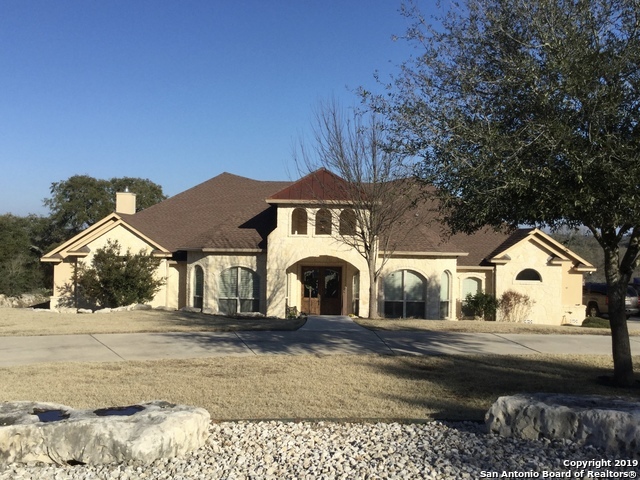 New low-e windows, spray foam n attic, 15 Seer HVAC, sprinkler system, in-wall vacuum, 600 sq ft patio, balcony w v"
"This beautiful rock home sits in the quiet Hill Country on 2.3 acres with lots of mature trees. Only a 5 minute drive to HEB, Home Depot or Wal-Mart, and lets not forget Starbucks. This home was barely lived in and has been well maintained, its a must see!! Great size 5 bedroom 3-1/2 bath, 2 living areas, office, nice kitchen w/ island and breakfast area, formal dining area and bonus game room above 3 car garage. Plenty of storage also. Nice fenced in back yard with beautiful pool, and a circl"
"Spacious River Crossing home located right across the street from the Guadalupe River in the gated community, The Waters. This home has a grand entrance with ton of natural light. Perfect for entertaining. Two master bedrooms- one upstairs and one downstairs. Enjoy the beautiful TX Hill Country, and just a short walk to the river. This 4127 square foot home is a must see!" "Recently updated hill country 3 bed/2bath split level charmer on 1.24 oak-studded acres in sought after River Crossing. Ample room for play outside, as well as inside, w/versatile Flex room in this split level. French doors lead to cozy office/sunroom full of natural light. Enjoy granite kitchen countertops, fresh neutral paint, updated lighting, hardwood floors, a massive rock fireplace & so much more! Newer roof & water heater (2018). Comal schools. WELCOME HOME!"